Transplant surgeons at Beaumont Hospital have just completed the first transplant in Ireland using laparoscopic, or keyhole, surgery. The new procedure was used in a living related kidney transplant to remove the donor organ. The adoption of this approach is regarded as being highly significant for the future of renal transplantation in Ireland. 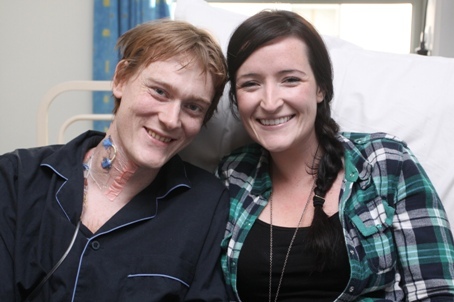 The transplant involved Kate Mooney who donated a kidney to her brother, Cathal. The procedure was carried out by a clinical team led by Ms Dilly Little, head of the Living Related Donor Programme at the hospital. The surgery was done earlier this week and both Cathal (pictured at right) and Kate are recovering well in Beaumont Hospital. Among the many benefits for donors that this less intrusive surgery has over conventional open surgery are reduced postoperative pain and risk of infection and fewer long-term complications. But for many donors the biggest practical benefits of laparoscopic surgery can be savings in time and money. Open surgery typically requires a donor to take between eight and 12 weeks off work to recuperate. But in some cases laparoscopy can reduce this time to as little as two weeks. The financial implications of this for the donor are believed to have played a major role in the dramatic increase in living donor transplants in the US in recent years. One recent US study, for example, found that 47% of donors donated solely because of the availability of laparoscopic donor nephrectomy (LDN) and would not have donated their kidney had this procedure not been available. Still a relatively new approach in renal transplantation, laparoscopy is rapidly being adopted as the preferred procedure by more and more centres. The first LDN transplant was carried out in the US in 1995 and grew slowly in popularity over the following 10 years. But over the past five years, with the benefit of a decade of practical surgical experience and patient outcomes, interest in the technique has grown rapidly in transplant centres throughout the US and Europe. According to the Clinical Director for Nephrology, Urology and Transplantation at Beaumont Hospital, Mr David Hickey, this approach could have a role to play in helping to close the growing gap between the number patients with end stage renal failure awaiting transplants and the availability of suitable organs. Traditionally people seeking kidney transplants have been dependent on the generosity of the relatives of people who have died and who are willing to release their loved ones' organs for transplant purposes. Ireland has been fortunate in this regard, enjoying one of the highest rates of organ donation in the world at 21 per million population in 2009. However, over the past few years the national kidney transplantation team based in Beaumont has begun to supplement this traditional supply with the introduction of a living donor related (LDR) programme. This helped to maintain growth in renal transplantation last year, when the 172 kidney transplants completed represented an increase of 11% on the previous highest year, 1988. Of the 2009 total, 18 were LDR. So far this year there have been 22 LDR transplants. In addition to increasing the pool of available organs, however, the living donor approach has other important potential benefits for patients. Studies have shown, Mr Hickey says, that an estimated 90% of live kidney transplants are still functioning at the end of one year and many patients are fit and well 20 years on. They have also shown that 10 years after living related transplantation approximately 80% of grafted organs are still working, compared to 50% from cadaveric transplants. However, there are other good reasons why the transplant team at Beaumont wants to see further significant growth in the LDR programme and hopes that laparoscopy will play a role in this. "At present there are approximately 600 people waiting for renal transplants," Mr Hickey says. "We will complete about 150 this year, which is fewer than the number of people coming onto the list. The underlying problem is that the list is getting bigger every year and people are waiting longer for a transplant as a result, which has serious implications for their long-term health. "For a variety of reasons the rise in end stage renal failure throughout the developed world, including Ireland, is going to continue to rise sharply. Unless they can get transplants, all of these people are going to require renal dialysis - inconvenient and time consuming for them and expensive for us to provide. "That is going to represent a huge financial burden and a huge challenge to health services everywhere. I really do not believe the penny has dropped yet about the long-term funding implications of this for the health service - it really is going to be enormous. The only practical and humane way to address this is by significantly increasing the number of living donor transplants we do each year. It is my view that for the size of population we have we should be aiming to do at least three a week."